Temperature dropped further in Srinagar and other parts of the Kashmir Valley and Ladakh region, freezing water bodies, Dal Lake and water supply lines in several residential areas. Cold wave conditions intensified in Jammu and Kashmir with several parts of the state at sub-zero temperatures. 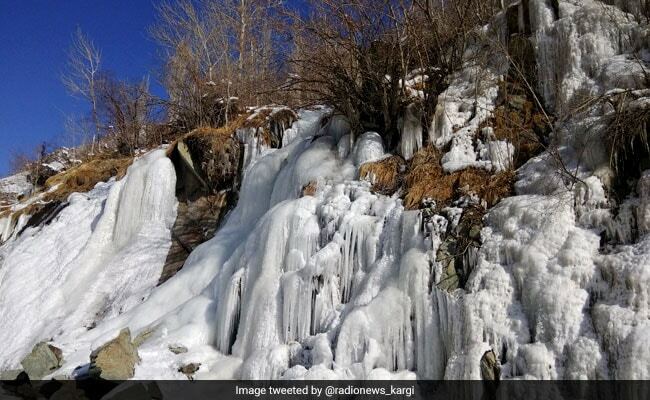 Kargil emerged as Jammu and Kashmir's coldest place at minus 16.2 degrees Celsius, the Met department said on Friday. Srinagar - the summer capital of Jammu and Kashmir - had experienced the coldest December night in nearly three decades with a low of minus 7.6 degrees Celsius on Wednesday, which dropped further to minus 7.7 degrees Celsius on Thursday, making it the coldest night of the season so far in the city and the coldest December night in 28 years since December 7, 1990 when the city had recorded a low of minus 8.8 degrees Celsius, the weatherman said. The Valley currently is under the grip of Chillai Kalan- the 40-day harshest period of winter when the chances of snowfall are most frequent and maximum and the temperature drops considerably. Qazigund in south Kashmir experienced its coldest night at a low of minus 6.7 degrees Celsius, down from minus 6.1 degrees Celsius on Wednesday night. The town had recorded a low of minus 7.7 degrees Celsius fifteen years back on December 22, 2003, the weather department said. The nearby Kokernag town had registered a low of minus 5.5 degrees Celsius, Kupwara in north Kashmir recorded a low of minus 6.3 degrees Celsius, Pahalgam settled at minus 9.5 degrees Celsius, while the ski-resort of Gulmarg in north Kashmir recorded minus 9.3 degrees Celsius on Thursday night, the official said. In Leh town in Ladakh region, the night temperature on Thursday settled at minus 15.1 degrees Celsius, the official said. The winters this season have been dry so far, although there was a spell of early snowfall in the first and second week of November. The Met office has predicted light rain or snowfall at isolated places in the Valley and Ladakh region on Sunday and at isolated to scattered places across the state next week.